If you’re reading this, you’re probably wondering about the Tuft & Needle pillow. Well, the popular bed-in-a-box brand uses its proprietary Adaptive Foam to offer supportive pressure relief to sleepers of all styles… But which positions are most compatible with the Tuft & Needle pillow? And does it trap heat like some other foam pillows do? You’ll have to keep reading to find out! In this review, I’m going to show you what this pillow is made of, how it feels, and which positions it’s best for, so that you can decide if this is the sleep accessory of your dreams. 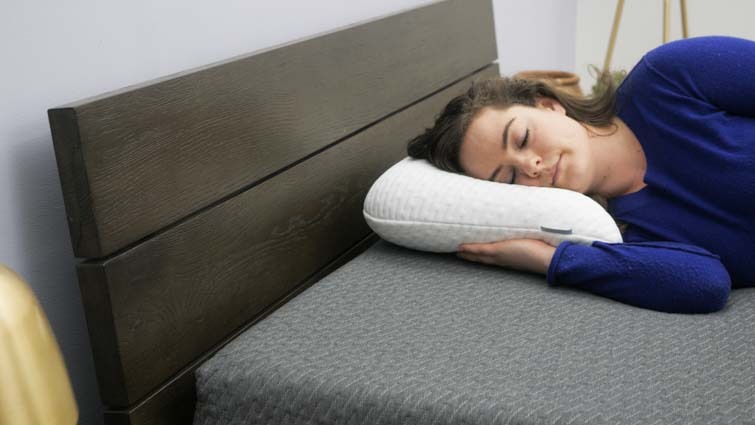 The Tuft & Needle pillow offers great neck support for back and side sleepers! What Is The Tuft & Needle Pillow Made Of? Before we get into the feel of this pillow, let’s examine exactly what it’s made of. The cover fabric of this pillow is made from a blend of micro polyamide and polyester. Micro polyamide is often found in spandex textiles, so results in a stretchy feel. Meanwhile, the polyester brings some moisture-wicking properties to the game (which is always a perk for us hot sleepers who sweat during the night). The cover also features a zipper on one side so you can easily remove it when it needs to be washed. And the cover is machine washable! Personally, I like that you can just unzip the cover, and throw it in the wash (not all pillow maintenance is that easy, trust me). 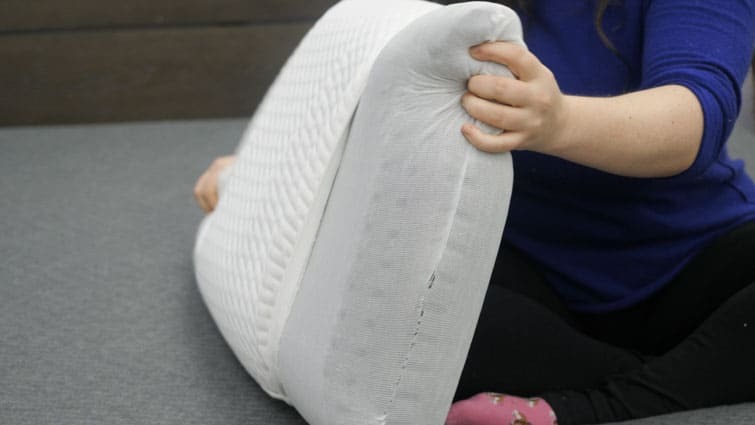 Inside the cover is one solid piece of the company’s proprietary Adaptive Foam, the same material used in the top layer of both Tuft & Needle mattresses. The foam is ventilated for better breathability, which serves to keep the pillow from heating up while you sleep (folks who run hot, we’re lookin’ at you!). As far as support is concerned, the folks at Tuft & Needle say the foam in this pillow is meant to strike a comfortable balance between memory foam and latex. It’s got a fairly lofty build at about 5 inches high, and is designed to offer medium-firm support. Now, you might be thinking, “But is this pillow more like memory foam or latex?” Well, let’s take a closer look at the feel of this pillow, shall we? 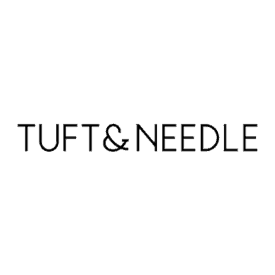 What Does The Tuft & Needle Pillow Feel Like? I’ve thoroughly tested this pillow in every position, so let’s talk about which sleeping styles it’s best for. The first thing I noticed about this pillow is how soft and silky the cover fabric is. It feels cool to the touch, and is also quite stretchy and breathable. As I rolled around with this pillow, I was pleased by the cover’s ability to stay cool and fresh. However, the cover fabric’s silky feel does make it a bit slippery so, if you choose to cover your pillow with a pillowcase, I suggest using one with envelope closures. That’ll keep the pillow from sliding out! The pillow itself is quite buoyant with a quick response to pressure, so I can tell it’s going to do a great job of maintaining its shape throughout the night. That said, this pillow is definitely more like latex than memory foam. It’s got a lightweight feel, and doesn’t feel densely supportive at all. Side sleeping on the Tuft and Needle Pillow was great! As I said, this pillow is very bouncy, so I was a little surprised by how firm it feels. I would say it falls somewhere between medium and medium firm, so I’m not sure I’d recommend it for stomach sleepers. 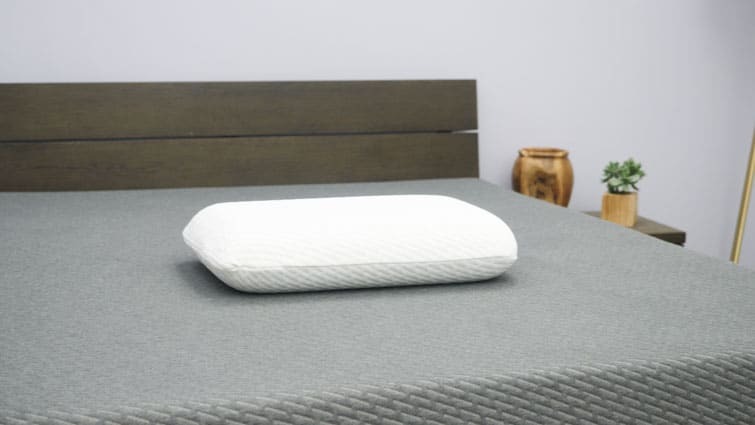 Between the lofty profile and firmer level of support, this pillow is much more compatible with back and side sleepers. Remember: stomach sleepers need a pillow with a soft feel, and a low loft in order to maintain a neutral spine. More: If you’re a stomach sleeper, check out my guide to the best pillows for stomach sleeping to make sure you’re sleeping on the right pillow! Testing this pillow on my back and side was really cozy, but particularly so on my back. 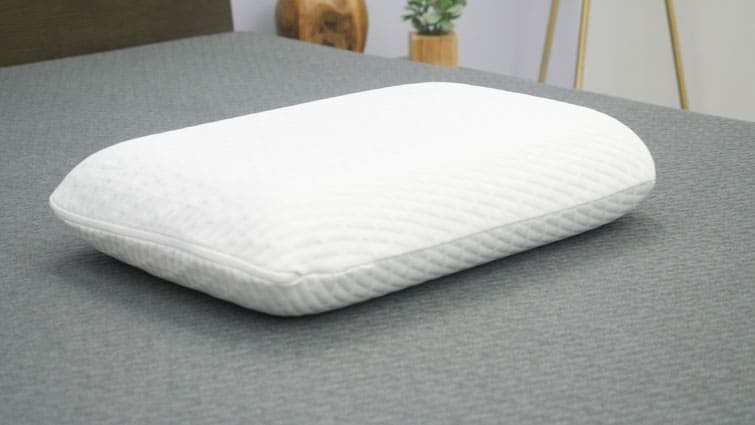 When I used this pillow for side sleeping, I never felt like my neck fell out neutral alignment with my spine (which is the most important thing), but I do prefer a pillow that I can bunch up and fold, and this buoyant foam doesn’t really allow for that. In my opinion, this pillow feels tailor-made for back sleepers. It provided great pressure relief for my neck, and shoulders, and the foam kept my head resting more on top of the pillow than in it. So, back sleepers who feel trapped by the slow sink into memory foam might want to give this pillow a try. Meanwhile, I do love how breathable this pillow is. Throughout the course of my rolling around, I never felt like the foam trapped my body heat at all (which is impressive, because I have a lot of it!). The Verdict: This pillow is perfect for back and side sleepers who run hot, and prefer the bouncy support of latex to the deep sink into memory foam. Should I Buy The Tuft & Needle Pillow? Let’s recap this pillows highlights (and potential drawbacks) so that you can better determine whether or not this is the sleep accessory you’ve been dreaming of. Cooling — The foam in this pillow is ventilated, which gives it great breathability and keeps it from retaining body heat. Additionally, the cover fabric is cool to the touch and moisture-wicking. Great for Back & Side — This pillow has a nice lofty profile of about 5 inches, a medium firm feel, and a quick response to pressure. So, it’s going to do a great job of helping back and side sleepers relieve pressure in the neck and shoulders, while also helping to keep a neutral spine. Generous Trial Period — Here’s a perk for ya: this pillow comes with a 100 night trial period. Let’s be honest, you probably don’t need 100 nights to decide whether or not this pillow is the right one for you, but it’s nice to have the time! If you do decide (within that 100 days) that this pillow is a no-go, just send it back for a refund. Wash Care — While I like that the cover fabric is machine washable, you can’t throw it in the dryer. It must be left to air dry. Additionally, the foam inside the pillow is not at all washable — it’s a spot-clean-only situation. Whatever you do, don’t throw this entire pillow in the washing machine, or you could damage the foam. 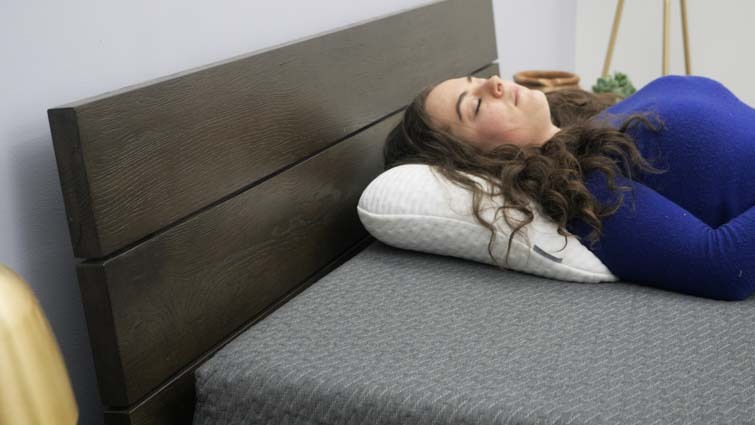 Not For Stomach Sleepers — In order to alleviate neck pain and keep a neutral spine, stomach sleepers need a pillow with lower loft and softer firmness. This pillow has a lofty profile at 5 inches, and a medium firm feel. Because it’s not adjustable (meaning you can’t reduce the loft at all), it’s really only compatible with back and side sleepers, in my opinion. Latex Feel — Sleepers looking for that deep sink into foam should probably look elsewhere. This is not a latex pillow, but it does feel like one. It’s super bouncy, light, and lets you rest on top of the pillow rather than sink into it. If you’re more of a memory foam fan, I’d definitely take advantage of the trial period before committing to this pillow. Free Shipping — to all 50 U.S. states, excluding Hawaii and Alaska for which there is an additional fee of $25. Wash Care — Wash the cover fabric in a warm, gentle cycle with mild detergent. Leave to air dry. Spot clean the foam.